Southland the Complete Fourth Season Uncensored DVD Review With strong storylines that really tug at your emotions and some great links to current issues in America, Southland continues getting better and better. It's a shame that it's about to end. After watching the fourth Season of the compelling police drama TV series, Southland, it left me in a state of melancholy as there is only one more season left. Ironically and today's fun fact, Southland had TV networking issues from day one that thankfully saw the series being picked up by another network. It was truly a happy end for Southland fans. In season four, familiar characters are back and some plot holes from the previous season are answered with new questions being raised for the viewer. This 2-disc collection from Warner features all 10 episodes and really shakes up the dynamics of this police drama. As we are taken behind the scenes of a group of police officers in the LAPD, we discover that they are the last defence between criminals and society which is unfortunately starting to show stress lines. Veterans are tired but fortunately there is always a new rookie to take their place and continue the fight for justice. However nothing is ever that simple in Southland and the creators really get into the heads of these characters and whether that's them interacting with each other, their families or the criminals that they face, it's quite a psychological journey. Although I've been a fan of Southland, the best part of Season 4 was the introduction of Lucy Liu (Officer Jessica Tang) who really brought a new dynamic to the storylines and the characters she interacts with. The first episode introduces Officer Jessica Tang to Officer John Cooper (Michael Cudlitz) who returns to duty after having back surgery. Cooper has been a staple to Southland and it's great to see him back on the forefront, especially with his new partner. Other characters include Detective Lydia Adams (Regina King) and of course Detective Sammy Bryant (Shawn Hatosy) who acts as a mentor for the rookies on the team. I loved the episode where Sammy accidentally shot a dog in the leg that really gave you a unique insight into his character, especially his caring nature. With that said, the stories of Southland are very aggressive and violent at times with murders, gangs, robberies and other nasties. Interestingly enough, the show is linked to the politically social climate of the United States. At times, it's like watching reality TV due to the gritty realism of the stories, settings and characters. The video quality of Southland Series Four is extremely sharp with vibrant colours. Audio supports Dolby Digital 5.1 and really lends itself well to the action. There are a handful of unaired scenes for the special features and this nicely rounds off this must have police drama TV series. 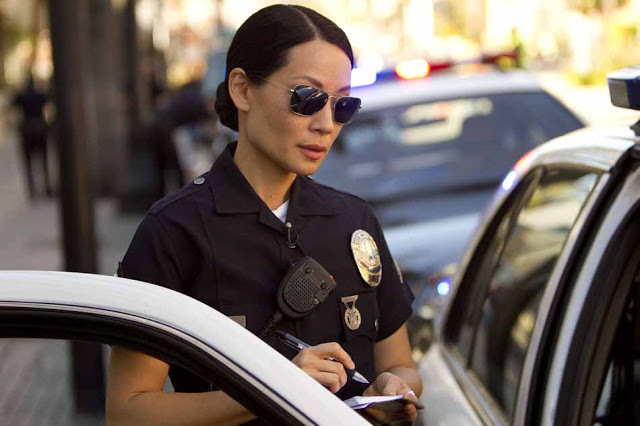 With the introduction of Lucy Liu's character, Officer Jessica Tang, Season 4 of Southland is the perfect point for newcomers to experience this well written TV series. With strong storylines that really tug at your emotions and some great links to current issues in America, Southland continues getting better and better. It's a shame that it's about to end.